One of the Experiences in R&P comes from our past experience in designing, planning and developing and later rolling out one of the biggest MPLS-based IP-VPNs globally with a standard-software-partner and helping the mobile telecommunication industry manage the challenges in a world that requires exponentially increasing bandwidth without loosing the standardization benefits. This experience has given R&P the background and capability of doing similar projects with varying partners and in varying environments. 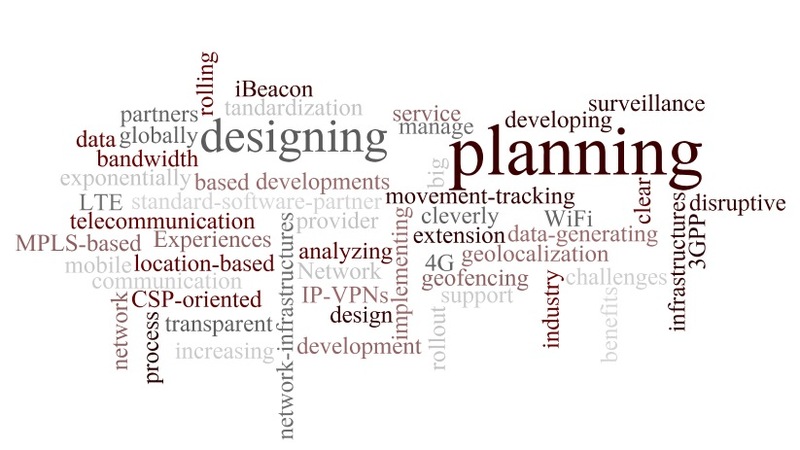 While the previous projects R&P partners were doing, were predominantly CSP-oriented, we are seeing a strong shift in projects being induced by other disruptive developments, like location-based surveillance or networkinfrastructures, that support analyzing ‘big data’ cleverly, based on data-generating infrastructures that allow geolocalization, geofencing and movement-tracking. 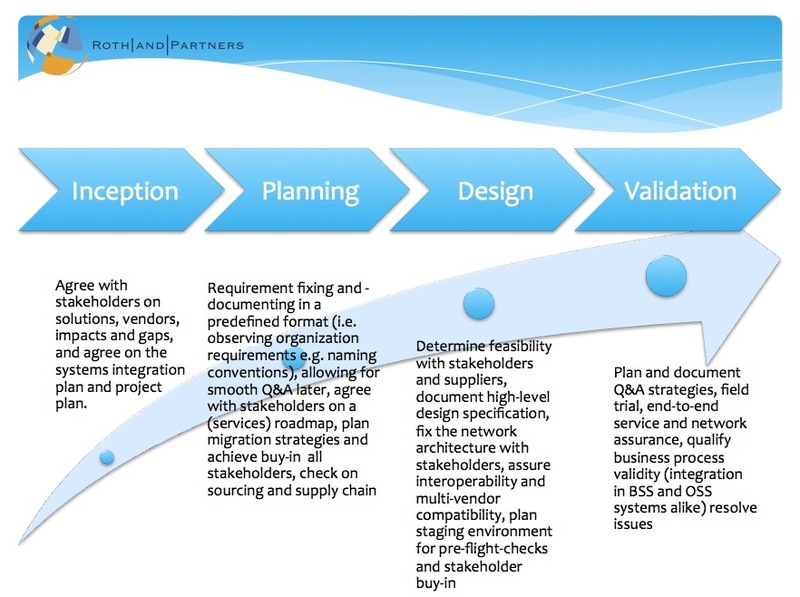 Yet, when it comes to planning, designing and implementing the network, we often find the predominant variables are very similar and can be handled applying a clear and transparent process. Following these simple steps seems easy enough. While on a high level, this is certainly true, in a real-world environment, it is not as straightforward as one could expect. Networks and organizations are living organisms. Both change while we go at them and make success a moving target. So getting and keeping the buy-in from the stakeholders (these consist of management and team members alike, just as the software partners, integrators and suppliers) is key for success. In disruptive, creative situations, the environment can not be assumed to be static and adequate organizational and planning measures need to be taken. This is, where your run-off-the-mill systems integrator will do one of two things: Choke on the contractual obligations or ask for ridiculously priced change requests. Now, there is a way to cope with scope creep and change request tsunamis. 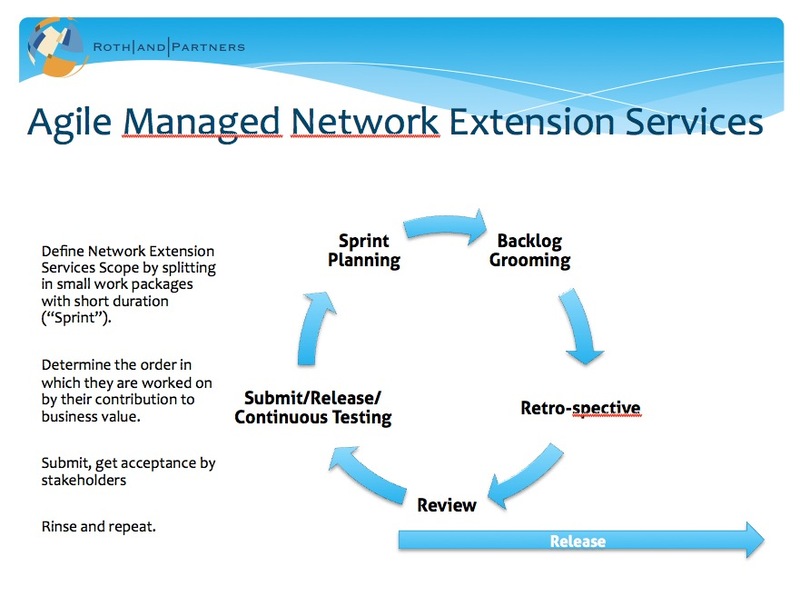 We call it AMNES, Agile Managed Network Planning and Extension Services. R&P have taken Agile principles from cutting edge software development and lean industrial production and introduced them into several areas, one of them being Agile Managed Network Services for CSPs. The Agile Manifesto suggests some ways that help teams to self-organize, while giving management and commissioners an overseeing framework which is finely cut and provides both a dashboard-like view on progress and the capability to drill down into the actual status of work. Tools for Agile projects abound and listing them is a chore for a never-tiring scientist. Pick one and use it and apply the principles to network extension work. The core of the Agile methodology is it’s orientation alongside business value. “Do not waste” is an underlying guideline in lean production. By applying both principles to a project cut into small chunks of work packages, we can determine which work to do first and above anything else. Avoiding to do things twice that have already been done avoids slack. So by enabling self-organization in small 3-7 heads teams, and by checking progress on a daily basis (and of course document it by submitting work-objects into a continuous testing cycle), feeding back the results into the work-process and refining the “end-product” while finishing the project is allowing high-efficiency as well as high-effectiveness, accounting for cost-decreases and rapid results at the same time. The Scrum-teams can be working in parallel, like small guerilla-groups of experts, each forming a “tribe”. Let us look a bit at the team-members and their spirits. The more productive the team gets, the better the spirits are and the team may enter in what Jeff Sutherland calls “hyper-productivity”. While under normal circumstances, the pressure to be swifter in deployment decreases the teams engagement and leads to less cohesion and identification. Once we let the team organize itself an allow it to get better and improve at its own pace, we detect a significant change. Having more freedom to explore innovative or interesting options and being supported by the organization leads to highly improved spirits and – as a side-effect, higher efficiency and higher cohesion between both team members and the organization as such. One of the members of each small team will act as a “scrum-master” and take the other members by the hand to improve over their current level. Jeff Sutherland has measured teams and typically Agile teams account for 30% of cost decrease and 40% of efficiency increases. With every year, new technologies are surfacing that are of disruptive quality. This is especially true for CSPs. R&P have kept you informed about some of the more interesting recent developments (e.g. smart tea-box sized base stations by Alcatel/Lucent or Ericssons Pico Cell, and pretty impressive developments in the area of WiFi unloading in 4G environments), but the most revolutionary developments combine geolocation and indoor location capabilities and 3G/4G/WiFi offloading by using clever access management and handover strategies. This is not always greeted with a lot of sympathy by all customers (e.g. in Switzerland the WiFi-offloading caused additional costs to some users, who complained about a silent change in the EAP-SIM settings causing them additional unwanted costs). In the long run, traditional CSPs will be challenged (or rewarded) by new market entrants and extended MVNO capabilities. Combining these offers wisely with cloud based solutions, clever analysis strategies in place to make good use of ‘big data’, and having a competent implementation partner for network extension and upgrading with a good hand for future disruptive business models and an orientation alongside business values will be key.